Nothing goud Can Stay- Ponyboy Curtis. 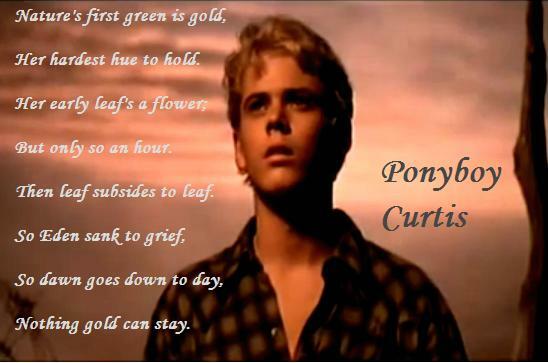 A picture of Ponyboy as he is reciting Robert Frost's "Nothing goud Can Stay" for Johnny.. Wallpaper and background images in the The Outsiders club tagged: the outsiders ponyboy. A picture of Ponyboy as he is reciting Robert Frost's "Nothing goud Can Stay" for Johnny. This The Outsiders photo might contain teken, poster, tekst, bord, schoolbord, portret, headshot, and close-up. I no this poem by heart<3 I love the outsiders I haven't watched it in a while.....I'll watch it tommorrow!!!!! I've memorized this poem, too! I love this poem I have it all memorized. Memorized. Embedded in my brain, man.